Introduced in the throes of the Great Depression, the General Purpose Wide-Tread Tractor Earns Its Place at the John Deere Pavilion. The General Purpose Wide-Tread tractor, better known as the “GPWT,” was first built in 1932. It served as a bridge between the General Purpose, or “GP” Tractor, introduced in 1929, and the Model “A,” which debuted in 1934. The “GPWT” marked an important new tractor form for row-crop farmers who needed both cross-cultivation capabilities to prevent weed growth during the growing season and higher ground clearance to prevent crop damage. A variety of implements were available for both two-row and four-row work to “cut costs to the minimum, at the same time doing your work faster and better,” according to sales brochures. Like the standard Model “GP,” the “GPWT” also offered four forms of power: belt, drawbar, PTO, and powerlift. It also featured a new “over-the-top” steering mechanism for improved visibility, giving the operator greater leverage and steadier control of the front wheels. This steering improvement became a mainstay on future John Deere tractors. The “GPWT” earned its place at the Pavilion for another reason. The tractor was unveiled in the midst of the Great Depression, when farmers needed to do more with less. 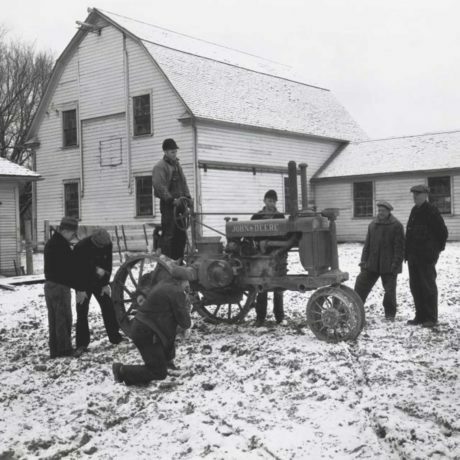 “As the Great Depression hit Americans hard in the early 1930s, John Deere stepped up to help employees, but of course had a responsibility to its customers as well,” noted Neil Dahlstrom, manager, Archives and History. “With economic conditions worsening by the day, farmers still had to produce enough to feed the country,” he said. Dahlstrom said help came in the form of innovative new products like the “GPWT,” and in many other ways too. Across the country, more than 3,600 banks failed in 1930 and 1931. At Deere, company sales fell from a record $67 million in 1930, to less than $10 million in 1932. In Moline, a local bank, holding the deposits of thousands of employees, was the victim of an embezzlement. Instead of letting the bank close, CEO Charles Deere Wiman convened Deere’s Board of Directors, and made a motion to give the bank a $1.2 million check to cover the loss. He explained his actions, saying “If we do not do this the bank closes…As I view it, there are approximately $7,000,000.000 of savings deposits in this bank, largely made by the wage earners of our factories, and the effects upon them of closing the bank, and the resulting consequences to this Company, are beyond calculation. While keeping the company afloat, the challenges to farmers continued to mount. 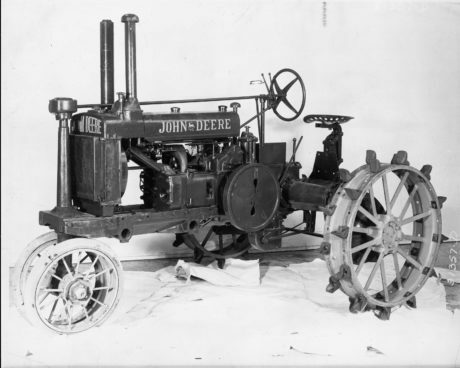 In 1931, Deere & Company took on $12 million in farmer notes, and early in the year extended terms on tractors and power farming machinery to three years for all tractors and implements over $200. As a result, not only were farmers able to keep their equipment, but it helped them keep their farms. It also formed a bond between company and customer that continues today. 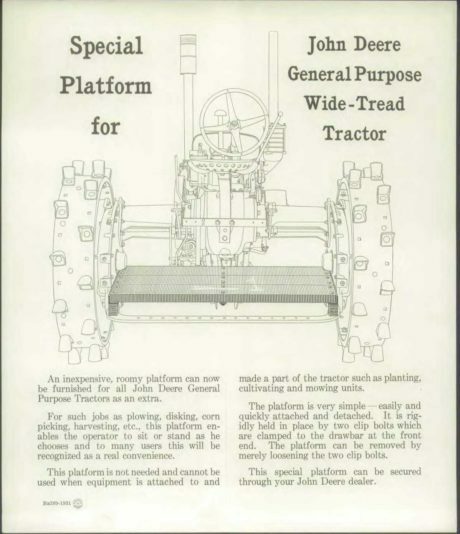 If you enjoyed reading about the history and development of John Deere's General Purpose Wide-Tread Tractor you might also like reading one of the stories below.